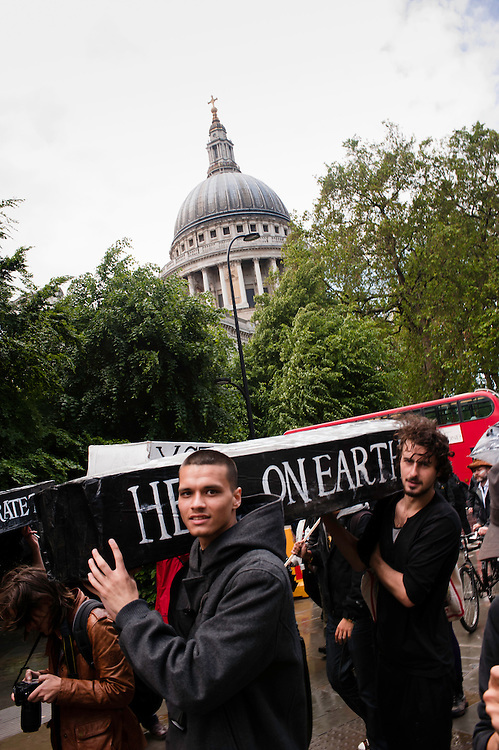 London, UK - 15 June 2012: two protesters hold a coffin during the Carnival of Dirt. More than 30 activist groups from London and around the world have come together to highlight the illicit deeds of mining and extraction companies. St. Paul's activist anti banner blockupy carnival carnival of dirt civil rights conflict crime demonstration denounce dirt extraction group human hundreds inequality london mining occupy occupy london participant people problem protest protester protesting rally revolt rights social social problems tension thousands uk reportage photo reportage photo reporter features reportage photography reportage photographer documentary photographer documentary photography editorial reportage photographs photographs image images picture pictures photo photos project photoproject photo project photograph photographs event photographer event photography events photographer events photography event photographer london events photographer london press photographer london press photography london press photographer news photographer fotografo a milano fotografo milano fotografo milano centro fotografo lombardia fotografo "milan photographer" "photographer in milan" "photographer in bergamo" "photographer milan" "photographer milano" "photographer in milano" "italian photographer" "photographer in italy" "photographer in lombardy" "fotografo a como" "fotografo a pavia" "fotografo a bergamo" "fotografo a trieste" "photographer trieste" "fotografo di milano" "fotografo a milano" "photojournalist in milan" "corporate photographer" "event photographer" "fotografo di eventi" "fotografo di eventi milano" "photographer in bergamo" "photographer in trieste" "event photographer milan" "milan photographer"